The purpose of this article is to share my experience regarding copyright laws, and the implications for live streaming of content, including music, photos, videos or texts without permission. Copyright laws have been in existence for more than 70 years. These laws must be taken seriously. Of course the professionals who work in film, advertising and the entertainment industry understand these laws because they deal with all kinds of legal requirements and licensing of music, images, film or video to use in their work on a daily basis. However, the digital revolution has made it possible for many people to become film and video producers, camera operators DJs and broadcasters without being required to study the rules and regulations of the industry they are in. This article is targeting those who are operating in the industries mentioned above with little or no knowledge about copyright laws. My own, painful experience involved YouTube immediately blocking two major events I streamed this year: Kenya In The Park and the Ugandan Independence UK celebrations. What is painful is that not only did I make an error of judgment by not paying attention to YouTube warnings, but also I happen to know about copyright laws. A simple explanation is that so much time was spent on sorting out the technical aspects and the logistics of how the events would be streamed on both occasions, that the music to be played at the events was not fully discussed. I had wrongly assumed that this would be mainly traditional African music that would not need a license, and had only mentioned copyright to the clients in passing. Another aspect of this painful experience is that streaming in places where internet connection is weak, or there is no connection at all, is costly. For example, streaming Kenya In The Park and the Ugandan Independence UK celebrations required an industry grade streaming encoder. On both occasions I used the L400 LiveU from Broadcast Services which is self reliant, but which costs £600 to hire for a day. You can imagine how clients feel when things do not happen as expected. The plan was to stream on both YouTube and on Facebook, targeting the Kenyan and the Ugandan community in Europe, Canada, US and of course Kenya and Uganda. Live streaming on YouTube can be particularly challenging. Whether one second or one minute of music is played at the event, YouTube will detect that it is unlicensed music immediately, and the whole stream will be blocked. From the time you are preparing the stream, YouTube warns whoever is streaming that before you stream you should make sure that you own, or have a license for the music to be streamed. Clients may not be aware of the situation regarding clearance of the music that will be played at the event, and will expect to see the livestream on YouTube or FaceBook without any problems. However, when the stream is blocked answers must be provided. Not only can this be very difficult to explain to the client, but if this keeps happening YouTube can pull the plug on the channel owned by the company doing the live stream. As it happens all was not lost because I always back up the livestream on an external hard drive. Of course I then had to allocate time to edit and post the video as a pre recorded programme. This problem can also be solved technically by having a different source of background music and the DJ getting the feed from my own mixer, that way I have total control of the sound. But I still believe getting a license is the best option. These two incidents have taught me a big lesson about not taking things for granted. As a result of these two events being blocked, and to avoid violating and losing my YouTube channel, in the future I will be responsible for obtaining the license for any event that requires live streaming. 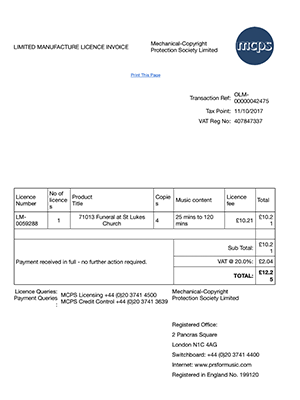 As an example I have included a copy of a license obtained from MCPS, authorising the video producer to use the music and record hymns for a funeral service. The address and the company is deleted from the agreement on the producers request due to personal information. More information can be obtained from the GOV.UK website [Licensing bodies and collective management organisations] also the PRS and MCPS [Mechanical-Copyright Protection Society] website provides information on royalties and licensing. A Collective Management Organisation (CMO) is a type of licensing body that grants rights on behalf of multiple rights holders in a single (blanket) license for a single payment. Generally speaking, rights holders will join a CMO as members and instruct it to license rights on their behalf. The CMO charges a fee for the license, from which it deducts an administrative charge before distributing the remainder as royalties. They are typically not for profit organisations and are owned and controlled by their members, the right holders.